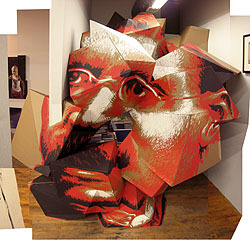 chipboard, flocking, balloons, helium, 96" x 60" x 84"
Acrylic paint on cardboard boxes, 30" x 30" x 84"
An aesthetic intervention/interuption/inconvenience in the office area of Bucket Rider Gallery, Chicago, Illinois. 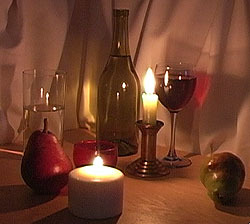 16" x 30" x 28"
Stop-motion animated still life, projected onto a wooden corner platform (to be mounted at eye-level, either in a corner or attached to a wall, with the projector hung from ceiling). Click image to view/download Quick Time video documentation. The boolean intersection of a tree and a domestic interior. 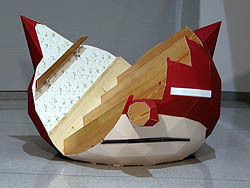 The boolean intersection of a giant cartoon cat head and a stairway. 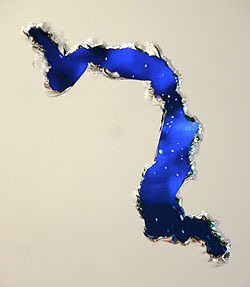 A mirror with an extra-dimensional tear in the space-time continuum. 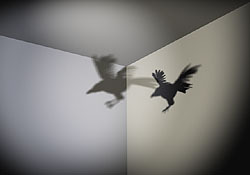 Animation of a circling crow casting shadows from two lights into a corner, minus the crow itself, projected into a ceiling corner. This 10 foot-high, 16 foot-wide sculpture is a mock-up for planning a black hole, similar to the maquettes used by God and Frank Gehry. 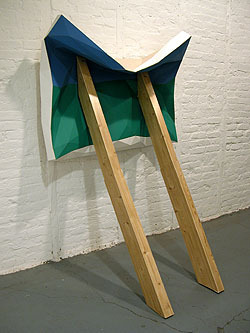 A maquette for the projection of shadows by an object (a hollow cube) onto a cave wall. 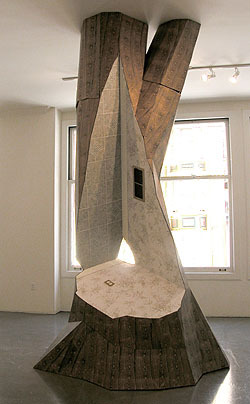 This sculpture is a life-size mock-up for planning a waterfall, similar to the maquettes used by God and Frank Gehry. 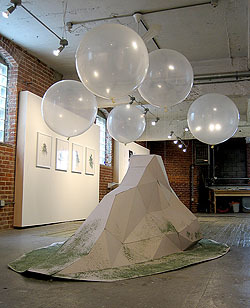 It was created as a temporary installation at Art Chicago 2004 as a project for 1R Gallery, Chicago, Illinois. Click image to view/download Quick Time video documentation and still images. 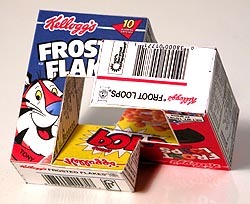 A first attempt at creating a boolean sculpture combining three "variety pack"-sized cereal boxes. 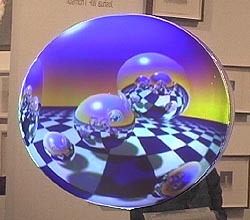 Single channel video rear-projected onto 1 foot diameter plastic dome, surrounded by 2 foot square mirror. 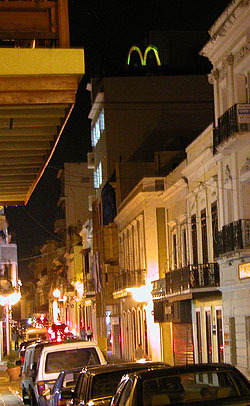 Video projection sculpture atop the roof of Galeria Comercial, San Juan, Puerto Rico. 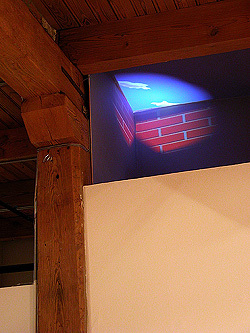 Single channel video projected onto three-dimensional construction. 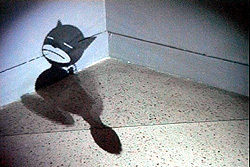 A projection of an idealized wall corner, with a cycle of sunlight and moving clouds. 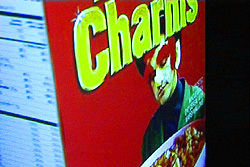 Single channel video projected onto three sides of a box constructed to the same dimensions as a Lucky Charms cereal box. 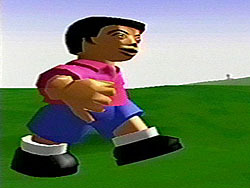 The video is a ten minute loop of myself living out the fantasy of becoming a cereal mascot. In the summer of 2000 I visited Gencon, the largest gaming convention in the world, with a video crew. 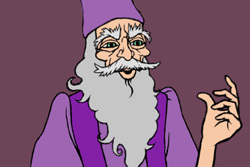 We interviewed thirty "gamers" about role-playing, and their favorite characters. This animation brings those idealized alter egos to life, but also reveals the mannerisms, speech patterns and idiosyncrasies of their creators. 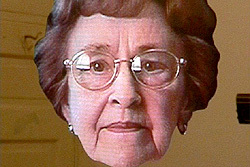 Click image to view YouTube version of the movie. 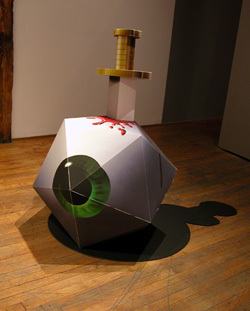 A 20-sided folded paper construction of an eyeball impaled by a dagger, including shadow. 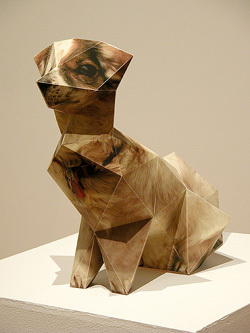 The sculpture was computer modeled using the methodology of computer games, and then texture-mapped with a high-res image. Click image to view larger images. 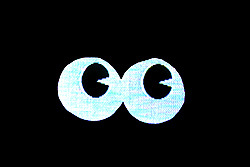 A pitch black room with four pairs of living, glowing eyes. A reconstruction of two Keanu Reeves films in which he portrays the Buddha. 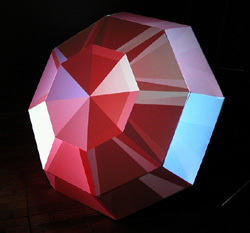 A real-time 3D animated installation incorporating a giant projection screen and 3D sound space. 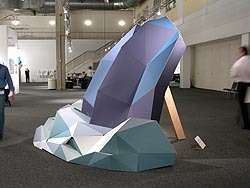 Viewers explored the video game-inspired landscape using giant joysticks. 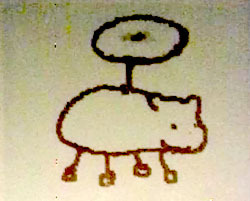 A series of animated doodles created on a Palm Pilot while traveling. 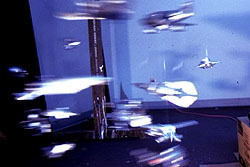 An installation in an abandoned storefront that gave the passer-by a view of a kinetic sculpture of a fleet of aircraft, as well as a live video feed of the same event. 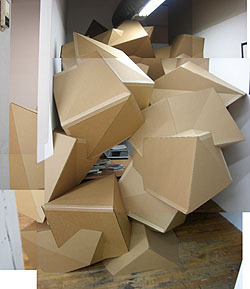 Hidden in the back of the gallery was a kinetic sculpture of the future, constructed from toys. 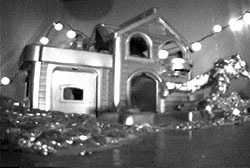 A security camera broadcast video of this world to the main gallery.